An alpaca and silk “unicorn”with some spring hued pips…. As promised, here are some pictures of the “unicorn” moonraker shawl…I’d actually finished knitting this a couple of weeks ago but we were waiting for some nice weather to go out with the camera…on the whole I’m pretty happy with it, it’s nice and drapey and feels light not too heavy, just the thing for spring really when the temperature can soon cool in the evening. I used some yarn that I’d bought in the Autumn from my local yarn shop (I loved the colour, a proper egg shell blue) but I don’t think it was such a good choice for this shape of shawl…..I’m not sure if it’s my knitting but both of the Moonraker shawls I’ve had to block quite heavily, and where as the wool yarn shawl was quite happy to put up with a bit of rough treatment and has held it’s post blocking shape perfectly, the alpaca/silk blend seemed a bit more fretful. I used about a million blocking pins (well 3 packets) and it all looked fine pinned onto the mats, but as soon as the pins were removed the yarn sprung back into itself and left some stretch marks behind. The bottom edge in this picture shows what I mean…that little up and down pointy edge, it’s not a picot bind off, it’s meant to be a straight line. It’s not the end of the world I know, but at the same time I know it’s not right and it’s distracting me when I see it…I’m wondering whether I could soak the shawl again and re-block it, and this time thread through some heavy silk thread (used like blocking wires) along the edge and see if that would do the trick….but apart from a wonky rippled edge, that’s my one grumble. The yarn is very soft and the shawl just falls back off my shoulders, it’s as flopsy as my legs after I’ve had more than a glass of wine. The row of red and pink “pips” are my favourite…I love how those colours sit so happily together, and when I’ve used up some of the yarn that seems to have bred in my work room, I’d like to try something in those lipstick and face powder shades once I’ve redued my stash some. (I’ve not been knitting for that long but somehow I seem to have accumulated half a yarn shops worth of brightly hued balls and skeins). Looking at these two top pictures I did sit a bit open mouthed at how much I look like my younger sister Rachel…where as I’m all dark brown hair (with kempy grey wisps) she’s a fawny blonde with a real peaches and cream complexion but our face shapes are the same, there’s a shared jaw line and mouth…even those straight eyebrows ….we’ve inherited all those from my dad’s mum’s mum…..
Mostly I’ve been influenced in my colour choices for the “pips” by what’s been growing along the verges and in the hedgerows, powdery primrose and pollen yellows, apple blossom soft pinks, new leaf greens….bright red tulips…and then there’s those two purple rows…in my head they worked really well but after I’d knitted those rows up I had some mis-givings but didn’t listen to my heart and carried on regardless. I found the aplaca/silk yarn very slippy to catch stitches when I was ripping out and correcting mistakes…the thought of then re-knitting it wasn’t thrilling me so ….I have two purple rows…when the shawl is worn scrunched you don’t notice them so much. In case you think I’m shooing away a bee or a wasp…I’m just re-adjusting the shawl but this picture made me laugh so I thought you’d like it too….. The Moonraker pattern is really easy to follow (and take it from me, if I thought it was hard I’d let you know) I’d certainly recommend it, if you can knit a knit stitch then you can knit a Moonraker. It’s very soothing to knit as for the most part it’s all worked in garter stitch so I was able to switch off a lot and just relax into the yarn and needles. And while I did like the yarn, I’ve got a skein and a bit left so will need to use that up for something or other…. I also know I preferred the feel of when I was using sheepy scented yarn, I missed that rustle as the yarn wrapped around my needles and the scent of those natural un-dyed wools. The shawl was knitted as part of the unkal/kal over at The Caithness Craft Collective Podcast’s Ravelry group…. Milky soft Blackthorn blossoms and crusty lichen roves…. We’ve had another couple of frosty mornings this past week but I’ve kept in-doors in the warm and have been well wrapped up with shawls and blankets…the weather seems as wobbly as my head as we’ve also had days where the late Winter sunshine has been really glorious….the other Sunday before we both took sickly we went for a stroll down the lane, not far, just a half hour walk, an hour tops, enough to shake out the cobwebs and return home all ruddy cheeked and noses pink. There’s a long stretch of Blackthorn hedges and trees which are all in blossom, frothy and delicate, the most milky white, with yellow and gold whiskers inside already heavy with pollen…. The hawthorn blossom isn’t heady like when we go and walk up in the woods to see the bluebells, where the scent makes me all sleepy, heavy and slow …..instead it fills the air with an uplifting sweet and crisp freshness. The combination of milky white blossom, crusty roves* of lichen and the mossy green smudges on the branches is one of my favourite, both blossoms and moss feel velvety but where one is smooth the other often allows your fingers to press deep and leave behind a faint imprint. It’s often hard to tell what something is in the hedgerow and a few weeks ago before the blossom was out it would have been near impossible, however Blackthorns are pretty much the first of the hedgerow trees to blossom (make a note if you see any because it’s from these trees which come October you’ll be able to gather sloes for gin and vodka)…..they won’t be hawthorns as even though it’s mild they’ll be another month at least…another way to tell the two apart is that Blackthorns blossom before their leaves appear, and hawthorns have their leaves first before they show any sign of blossoming….their leaves are also quite different in appearance but as they aren’t showing yet that doesn’t really help you identify them. (once they’re out, the Blackthorn leaf is almost oval, pointy at each end, the hawthorn is much more like a tiny oak leaf, all meandering ins and outs in shape). Hawthorns are edible too but they are better slowly cooked along with rosehips for syryps and citrusy tasting preserves. *when we were small and fall over and get a cut, as it healed over we’d call what formed on top a “rove”…it’s a proper old Suffolk term and one I know not so many people seem to use, certainly not once you’re out of the Suffolk and Norfolk area as I alwasy have to explain what I mean to friends from out of this region. “Rove” sounds much nicer to my ears than “scab” which always makes me think of old toad backs and unpleasant things, not that a rove is a particularly nice looking athing but just saying “scabby” makes me shudder. Gorgeous goosgogs and a refreshing cordial. 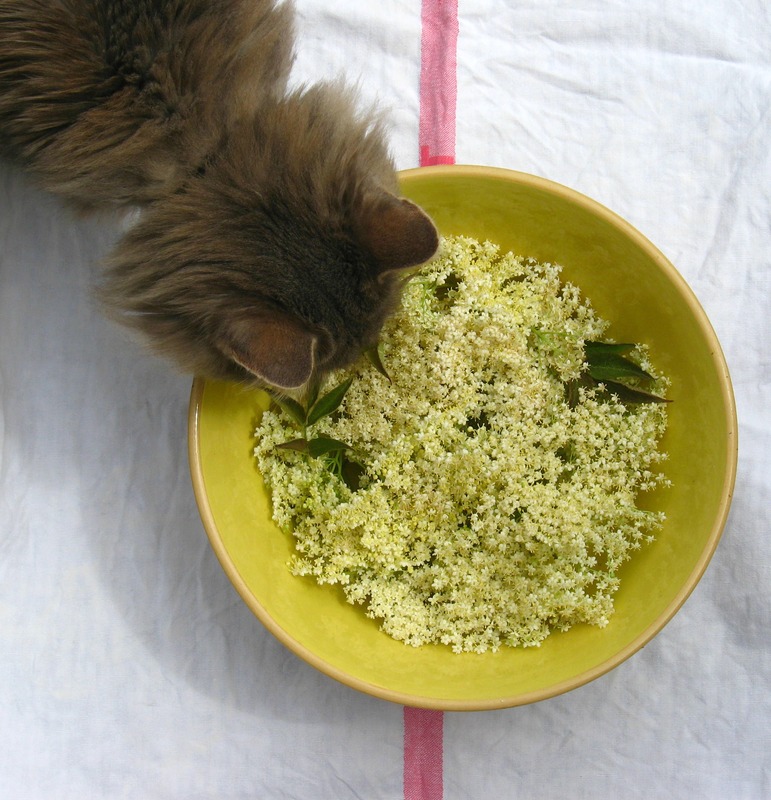 When I’ve been out walking I’ve noticed the abundance of elderflowers this year, while all the heads may not be huge, the flowers are rich and heady with pollen and scent, they smell gorgeous and I thought to pick some during the week to make some ice-cream and cordial. One of my friends gave me some strawberries and gooseberries from her allotment and while I’ll happily eat strawberries until they come out of my ears, I’m not the biggest fan of cooked gooseberries unless they’re in a jam…..however we’ve still got a pantry full of preserves made last Summer (since I’ve had to stop eating bread I realise just who it was eating all the marmalades and jam on toast…me) so I thought it would be a bit daft to make more, and then I found a recipe for gooseberry and elderflower ice-cream and thought it would make a nice pudding now the weather has turned almost overnight from wrapped in woolies Winter to scorchy Summer . The ice-cream is very easy, and was nice although I think I should have used more elderflowers as the taste was very subtle (the heads I used weren’t huge so maybe I should have bunged more in)….I used the recipe from Sarah Raven’s Garden cookbook….this is one of my favourite recipe books and I’ve seen it quite cheap on a few on-line places…..she’s a great cook and there are some nice “foraging” recipes using food you can find in the wild. The fruit and flowers are cooked with a little water to which you allow to cool and then you beat egg yolks and sugar together, whip some double cream, and then whip the egg whites…the cooled puree is mixed in with the yolks and then you add the cream and the egg whites before putting it in the freezer…..the full recipe and quantities are in the book. It’s great because you don’t have to keep taking the ice-cream out of the freezer to whisk…….using the freshest eggs and best cream will make a big difference as will using home grown fruit. And as you can see, I had a little assistant to help me….the bowl wasn’t down two minutes while I got my camera but someone had to stick his nose in to see whether there was anything interesting inside……the lovely bowl is one of the few remaining kitchen items I inherited when my nanny died, I love the yellow glaze inside, and I’ve not seen another one like it. Put a kettle on a boil the water….put the sugar into a large bowl (I used my jam pan* as it’s nice and big)……and then pour on the water…stir to dissolve the sugar. Grate the lemon rind and finely slice the lemon. 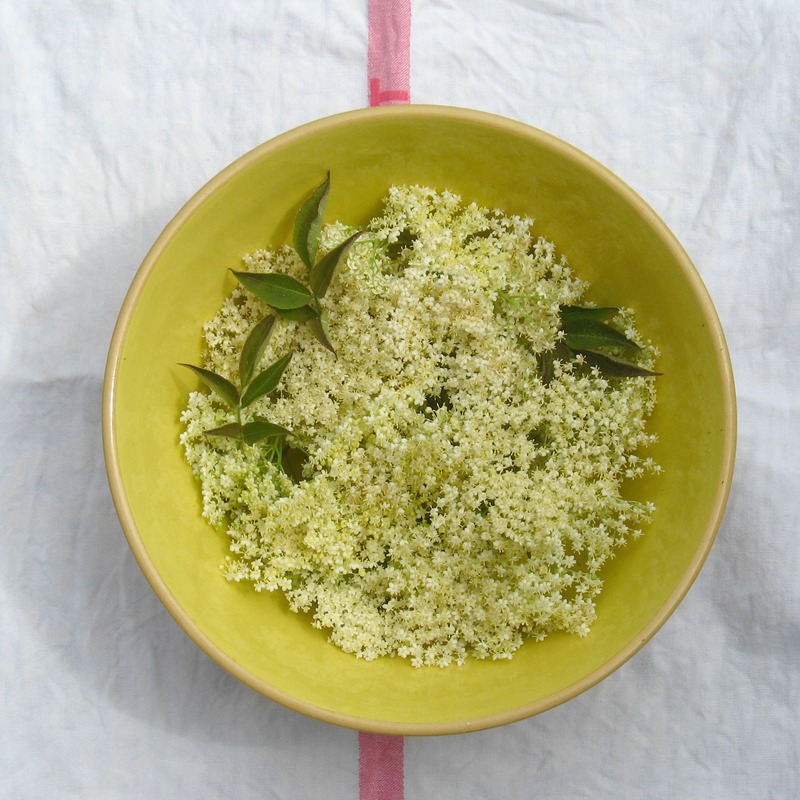 Give the elderflowers a gentle shake making sure sure there aren’t any little creepy crawlies or eggs attached to the flowers…..immerse in the syrup and cover with a large clean tea towel. Leave for at least 24 hours…stir occasionally. Sieve the mixture through a large square of muslin, and pour into sterilised bottles** and then seal. It’s really important to store the cordial in a really cold place as if it gets warm it will ferment, the glass bottles can explode, and you’ll be cleaning up sticky syrup til the cows come home…so if you don’t have room to keep this in the fridge, perhaps pour the cordial into ice cube trays/bags or small plastic bottles and store it in the freezer. Next batch I make I’m going to add some crushed lemon verbena leaves….. The past few weeks our wild and alpine strawberries have been ripening in moments of sunshine, because it’s not been great weather-wise they’ve had to work hard and the berries are even more intense flavoured than ever this year. 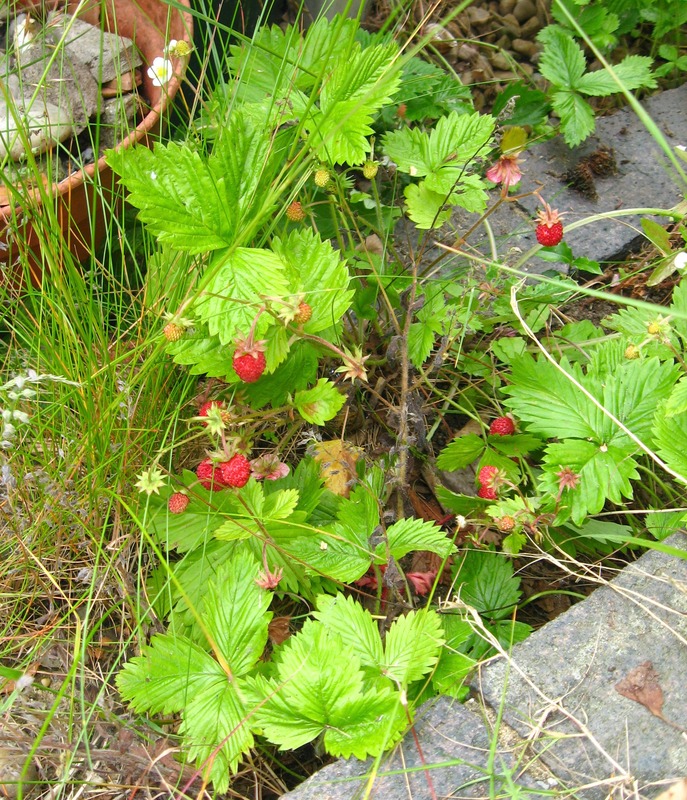 As always it’s the plants that grow where they please that have produced the best tasting berries and although I normally have a small handful scattered over yoghurt for breakfast I’m thinking to adapt the cordial recipe and try and make a strawberry one. We’ve also had the very first of the raspberries (no pictures though as I was too busy cramming them into my mouth to worry about getting my camera) ….this is very early as they’re a late season variety (Autumn Bliss)…the plants are already laden with berries so perhaps we’ll have a bigger first harvest….. (last year we only had a few in the first crop followed by a few weeks of nothing…but then our second harvest was the best ever…thankfully I’ll never get fed up of eating warm raspberries picked just minutes before). * not the fancy copper pan but a cheap one I bought some years ago from a local department store. ** We’re somewhat addicted to Lorina lemonade, and always save the bottles for cordials as they have lovely tops and are a fantastic size….or we give them to friends who make fruit drinks.